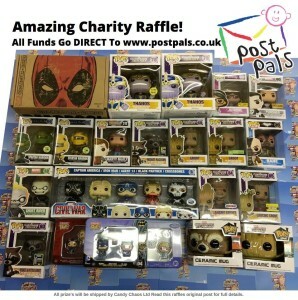 Pop n Candy are also holding an amazing raffle with prizes worth just shy of £1000, one winner will get everything. As the items are collectable the actual value of the prizes are just going to keep rising! They include lots of very sought after Pop figures, a Deadpool goodie box (individual items from inside are currently selling at £30+ each). Not forgetting 4 months of candy being sent to you! If you win you can become a collector, sell them on (£1000 return on a raffle ticket isn’t bad!) or donate them to Post Pals. To enter join the group ‘Friends who like Pop N Candy‘ and follow the instructions on the pinned post. 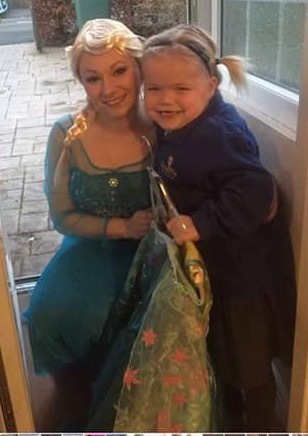 Earlier in the year Post Pals purchased some special Frozen dresses and Darth Vader costumes from In Kind Direct. The majority of Pals are going to get a fancy box in the post with their beautiful dresses inside. We went one step further with Ella though and asked Elsa if she would deliver the dress personally. Ella’s Mum said she wanted to go to bed in the dress! The dresses don’t go in with her fancy dress clothing but instead have to be hung up carefully as they are so special. We loved seeing Elsa make her happy but it’s wonderful to see Ella looking so well and walking too. There have been many times since Ella joined Post Pals 6 years ago, that it look like she wouldn’t pull through. 2 transplants, a huge stroke and countless time in PICU on a ventilator and she is still here, still smiling. Ella still lives with complications from treatment and damage caused by being so ill.
A few years ago Ella made us this little video while in hospital. Thank you to In Kind Direct, Candy Chaos for sponsoring Elsa’s outfit, Angel and Jaymee for making Ella’s dream come true. 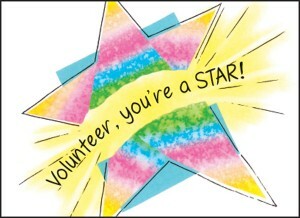 Our third Star volunteer is Rachel, a little girl with a big heart and who had a very big idea to make the Pals smile. We asked her Mum to do a little write up about Rachel which we will share below. Rachel found out about Post Pals just before Christmas when her Rainbows unit inspired by her leader Lisa, raised some money at their art gallery to buy Holly and James a present. She was tasked with choosing Holly’s which she enjoyed doing. A couple of days before Christmas she asked whether she could use the sweet shop she’d asked Father Christmas for, to sell sweets to buy more children a present. She started selling to family over the Christmas holidays. After that she had us selling at work and on Facebook- lucky no one seemed to be on a diet! During this time, Rachel wrote to lots of sweet companies asking for any spare sweets and Sainsburys, Marks & Spencer and Hope & Greenwood all supported her. 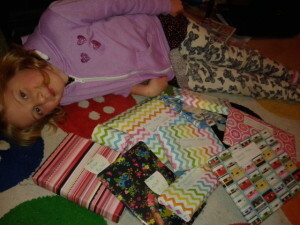 This raised a lot of money and Rachel was able to buy presents for many different Pals. She had been doing this very carefully, looking at each profile and trying hard to choose something that Pal would like. Suddenly Rachel realised she had bought a present for more than half of the Pals and she became determined to buy a present for every single Pal. 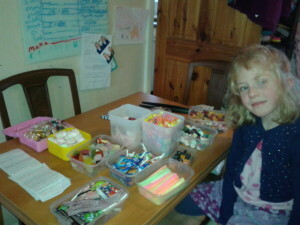 That is just what she did; she has now sent a present to every single Pal, through selling over 350 bags of sweets. 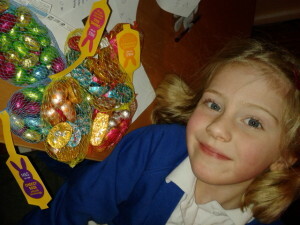 To be honest though, she must have bought thirty of those herself with her pocket money! 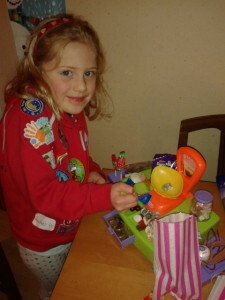 Rachel came to all of this on her own; she is only six, wanting to spread a bit of happiness but she has also spread the word about Post Pals. 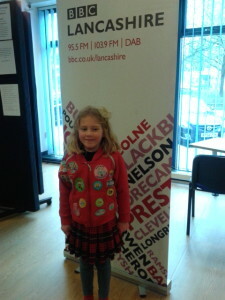 Rachel has been in our local paper, the Lancaster Guardian and on BBC Radio Lancashire. Rachel would like to keep writing to Pals and keeps reading the lovely thank you card that was sent by Malachi’s mum (which was completely unexpected). Post Pals is a wonderful thing and hopefully Rachel will have inspired more people to send a Pal a smile!